Diaries are available in a wide range of formats; everyone has their own favourite style of diary. 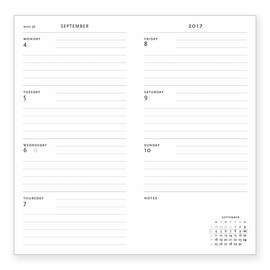 Each format is described below, please click through to view the available diaries in that format. Horizontal week-to-view diaries have the week set out over a double page spread with 'paragraph style' entry for each day. 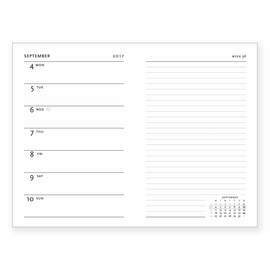 This is the most popular diary format we sell. 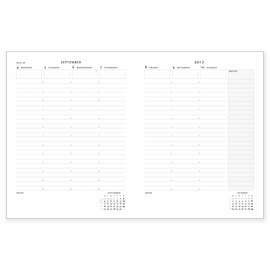 Vertical week-to-view diaries are ideal for busy appointment schedules. The week is laid-out over a double page spread with days running as columns down the page with useful timed entries. Verso diaries have an entry for each of the seven days of the week on the left hand page of a double page spread, and, a page for note taking on the right. 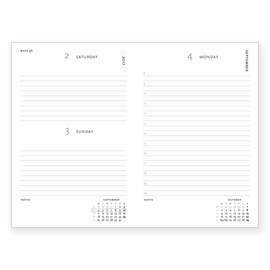 These diaries are ideal for keeping appointments for each day on the left whilst the ruled page on the right is ideal for making brief notes in meetings, to-do lists, expanding on appointment details or keeping journal entries. These daily diaries have a page for each week day (weekends share a page) making them ideal for those with more hectic daily schedules or for keeping a journal.